Hair treatment against hair-loss with airbrush in slow motion 4K. Medium shot of man in focus at hairdresser receiving hair treatment with special airbrush tool. Woman carefully spraying on bald head. hd00:16Hair treatment against hair-loss with airbrush in slow motion HD. Medium shot of man in focus at hairdresser receiving hair treatment with special airbrush tool. Woman carefully spraying on bald head. hd00:17Airbrushing man hair against baldness slow motion HD. 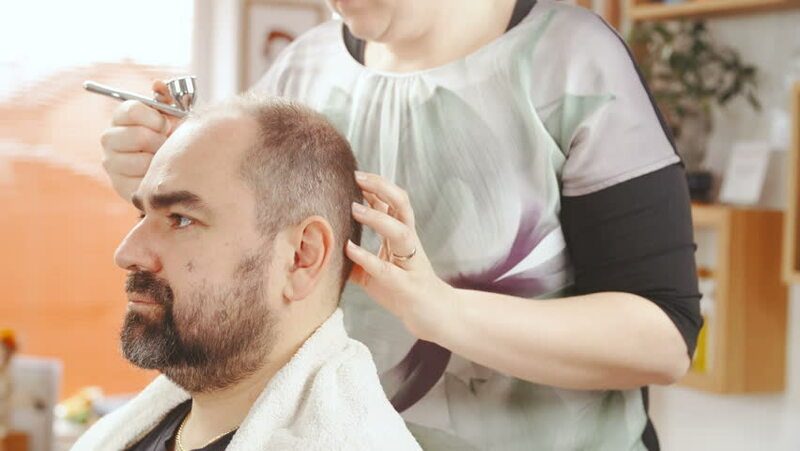 Medium shot of a male person in focus at hairdresser salon receiving treatment for hair growth. Woman brushing special serum over hair. 4k00:17Airbrushing man hair against baldness slow motion 4K. Medium shot of a male person in focus at hairdresser salon receiving treatment for hair growth. Woman brushing special serum over hair. 4k00:08Close-up of professional male barber makes haircut with electric razor at barbershop in slow motion. 4k00:16Man with hair loss problems close-up 4K. Long shot dolly slide of mand top of the head in focus while looking down showing bald parts of the head. 4k00:16Woman with new haircut shake with head left and right in slow motion 4K. Dolly slide long shot of woman hair in focus while shaking long blonde curly hair around. 4k00:16Washing person head with shampoo close-up slow motion 4K. Static shot of male hair in focus while hands washing gently with shampoo and water inside the sink at hairdresser salon. 4k00:16Washing male person short hair at hairdresser salon 4K. Wide slow motion of man head in focus inside the sink while female person washing head with water. Shampoo bottles in the background. 4k00:17Applying cream on male person hair close-up slow motion 4K. Long shot of person's hair in focus while another person hand with cream gently applying all over the head. Hairdresser salon. 4k00:16Hairdresser washing away shampoo from man head in slow motion 4K. Static shot of male person head in focus inside the hairdresser sink while female hands washing shampoo from hair. 4k00:16Pouring water over person hair to wash out shampoo close-up slow 4K. Close-up static shot slow motion of male person hair in focus with water running through hair while washing at hairdresser salon.